The last mile is always a challenge for the delivery industry Automotive corporation Continental teamed up with startup ANYbotics to combine the mobility of a four-legged, Boston Dynamics-style robot dog with an autonomous delivery vehicle. A vision of the future of delivery. 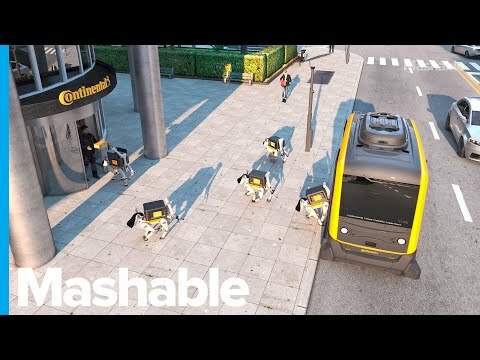 The concept is an unusual one: an autonomous vehicle pulls up to an address and spits out one or more smaller robot dogs, which ANYbotics calls “ANYmals,” to complete the delivery. During a live demo, the robot dogs climbed stairs and even rang a doorbell. A Distant Future : This tech is probably still many years out. We haven’t even figured out if we’re willing to share public sidewalks with tiny wheeled delivery vehicles yet.